This Saturday we took our first solo family trip to Seoul. We decided to go to Lotte World which skirts a river lined with Seoul's blooming cherry blossoms. Lotte World is made up of the largest indoor park in the world, an outdoor park, a man-made island on a lake as well as a hotel, sports complex, a Korean folk museum, a shopping mall and a theatre. 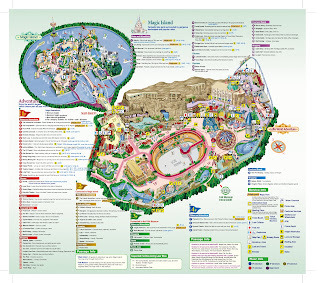 It is extremely large - here's the guide for just the park itself. Any adventure in a foreign country starts with actually getting to your destination. It took us about an hour and a half to get to Seoul and park which is pretty typical. But then it took another hour and a half to find the entrance to Lotte World which included walking in a maze across the entire complex. But we kept a positive spin on things by doing a bit of exploring along the way - we snapped this cool shot of a Korean brewery right below the Lotte Hotel. It's worth a note to say that we found what was the entrance right away but the security guard wouldn't let us go down the escalator but we couldn't communicate with each other to find out why. The language barrier sometimes is just too hard to overcome! We finally made it to the entrance, purchased tickets and we were finally ready to have some fun! On account of the rain it was packed! The ceiling caught our attention first - it was made up of an enormous skylight. And along the perimeter of the 5-story ceiling were monorails and simulated hot air balloons touring the facility. Below the ceiling was the largest ice rink we've ever seen. Around the ice rink there were 5 country-themed levels. Our very first stop was the Korean Folk Museum for some authentic Korean food. We didn't anticipate it taking so long to arrive so it was 2:30 by this time and we were famished. There were several restaurants and we chose based on the menu - here it is pretty customary for eateries (even at the mall food court) to display their menu using fake food which is great for us foreigners! They even had a display at the New York hot dog eatery. The restaurant primarily had a traditional set-up where you sit on the floor but Cooper's not ready for that quite yet so we opted for a table. The meal was wonderful as always. Next we rode the carousel - the wait was about 30 minutes or so but Cooper was entertained by the carousel itself so it went pretty quickly. I was so excited about those hot air balloons but the wait was over 2 hours so we decided against it. The wait for the monorail was almost as long so we opted out of that ride as well. No worries - we visited the Italy, America, Germany, and Mexico-themed floors and had a lot of fun! It rained all. day. long. but we still wanted to take a peak at the Magic Island. So, we bundled up in our rain gear and headed outdoors. Most of the Island was shut down but we still got a taste enough to know that we wanted to come back. And it was worth it just to see the Cinderella-like castle! Soon after we strolled back indoors and caught a bit of a Korean stage show. It was a broadway-style montage of popular stories. Here's a video with Korean music and a little video of the performance and some of Cooper. My favorite part of the show was the Wizard of Oz performance - there was a background image of the yellow brick road and Oz, what sounded like a Korean version of "follow the yellow brick road" and all of the characters you'd expect... well almost. There was Dorothy, Tin Man, the Lion, and Pinnochio! Ha! Only in Korea! No trip to a theme park is complete without trying on hats or ears of some sort. It was much like Disney here - I think every third person had on a pair! There were a lot of rides that we just admired from afar - like this great water ride that we watched from a couple floors above. To the left of this picture is a steep drop of the ride from a waterfall and there are roaring dinosaurs along the river as they float past. And we stopped at every little car or train we saw for Cooper to ride. Looks like a great Sunday afternoon. Our Household Goods Have Arrived!